Ages 11 through adult. The activities in this book help students develop the writing skills necessary to communicate basic information in a variety of situations. Skills emphasized include writing personal information on forms, writing phone messages, spelling common names, addressing envelopes, making notes on a calendar, making lists, taking notes, and sending personal notes. 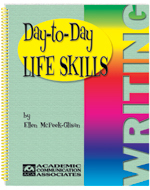 Day to Day Life Skills: Writing is divided into 12 units, each consisting of three lessons. Each unit begins with a page that includes instructional objectives, teaching suggestions, and "hands-on activities" that can be used to reinforce the skills being taught. Each activity also includes a "tips" page. Students are challenged to react to situations, to write down information, and to interact with others through communication.